It's been worth the wait and the re-release on Blu-ray has given the film another shot of acclaim and appreciation as one of the greatest films of all time (despite not making the Top 50 cut from Sight and Sound Magazine). The film is amazing no matter what format (even VHS!). On Blu-ray, it’s spectacular. It’s one of Spielberg’s least glossy films. Filming mostly in exteriors on locations and on the ocean meant there was little artificial lighting to be done. 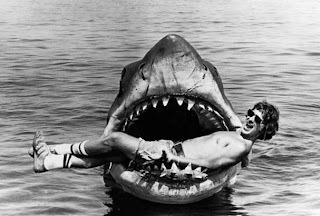 Instead Spielberg relied on Bill Butler’s camera realism for dramatic effect. But hell, the film looks sharp enough to cut glass. Filmmakers in the mid- to late-'70s often used trendy diffusion filters, which created a soft look to many films. Jaws has edges - razor sharp edges like shark’s teeth, a look only enhanced by high definition. If anything, the special features offer minimal extra bonuses that have not already been seen in previous incarnations. The ‘new’ materials include a fan-created documentary entitled The Shark is Still Working: The Impact and Legacy of Jaws. It’s actually an older documentary, up-rezed in HD specifically for this disc. Unfortunately, it’s pretty awful and dated. Roy Scheider’s voiceover is overwritten and offers a simplistic examination of the making of film featuring anecdotes already familiar to us but told as if we’ve never heard of the film before. The treasure of this disc is still the Laurent Bouzereau-produced 2-hour making-of documentary, originally released on the Jaws LaserDisc in the '90s. Bouzereau’s doc, comprehensively told, tells us everything about the production and has the story of Jaws covered from every angle. The candor of Spielberg, who is never shy about revealing details of the production, is still a joy to watch, and no one can tell a story better than Richard Dreyfuss. Jaws is available on Blu-ray from Universal Home Entertainment. Jaws is just plain awesome. a classic. need not say more. Jaws: you might love it or you might hate it but it is a great film and way ahead of it’s time in my opinion. It was released in movie theaters seven years before I was born but even when I got to see it for the first time in the late 80’s, people still talked about it as if it was new. My kids hadn’t seen Jaws so we decided to rent it through Blockbuster @ Home. A Dish co-worker was telling me about the movies, games and TV shows you can get by mail so I tried it out. The movie was here in just a few days and all I had to do was stick it back in the mail. Jaws is a fantastic movie and if it doesn’t scare you it will at least make you think twice before you get in the water. I can’t wait to buy the Blu-ray for the beautiful picture, all the extras and the original theatrical trailer. This may be on the of the best blu rays I own. The transfer is really amazing and just looks, errr, jaw-some. Hi I haven't still watched the blu-ray version and I already know that it will become one of best ever movie experience...btw does anyone knows the name of that person who is the jaws poster? I think is a comedian but I cant remember his name..